The mission of the Phoenixville Community Health Foundation is to improve the health and quality of life for people in the Greater Phoenixville region by increasing access to quality healthcare services and promoting healthy communities through grantmaking and collaboration with health, civic, business and community partners. 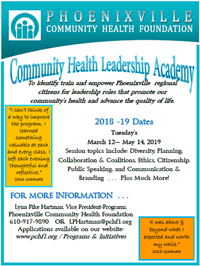 The Phoenixville Community Health Foundation seeks a President & Chief Executive Officer to lead the Foundation’s community-driven philanthropic programs, partnerships, grantmaking and business affairs in service of improving health outcomes and addressing the social determinants of health for all residents of the Greater Phoenixville region. The President & CEO reports to the Board of Directors. The ideal President & Chief Executive Officer will have an authentic, inclusive and visionary approach to philanthropy, health and community engagement; experience managing organizational finances and investments; strong communications skills, and; the ability to engage and inspire Board members, staff, grantees, community leaders and residents in meaningful ways. Provide vision and leadership to advance the Foundation’s mission through effective, impactful and fiscally responsible grantmaking, programs, partnerships and investments. Supervise the Foundation’s staff (currently three full-time) and nurture a respectful, equitable and enthusiastic internal culture. In conjunction with the Board of Directors and staff, set the Foundation’s strategic direction for grantmaking, programs and partnerships. Oversee the Foundation’s annual grantmaking process. Enhance the Foundation’s identity and reputation as a trusted and visible community leader through strategic communications in print, online, with the news media and through participation in relevant public meetings and community events. Serve as a convener, facilitator or member of collaboratives, networks and cross-sector partnerships that help advance the Foundation’s mission. Cultivate and share with others a deep level of knowledge and expertise about current and emerging community health needs, as well as an awareness of trends and best/promising practices in health policy, practice and philanthropy. Support the Board of Directors in fulfilling their governance roles and fiduciary responsibilities. Develop and maintain effective and efficient operational standards, controls and systems for accounting, administration, communications, human resources, finances and technology, including the selection and oversight of contracted vendors and consultants as needed. Ensure the long-term financial sustainability of the Foundation through responsible asset investment management and sound fiscal administration, including budgeting, accounting, investment planning, and compliance with federal and state laws. A bachelor’s degree and a minimum of ten years of relevant experience, preferably in a philanthropic or nonprofit organization, are required. A master’s degree in business, health, nonprofit or public administration is preferred. At least five years of experience in leading a team or supervising staff is preferred. The ideal candidate is exceptionally skilled in verbal, written and social media communications, community engagement and strategic thinking. The ideal candidate must be willing to live in the Greater Phoenixville region. The Phoenixville Community Health Foundation has retained the services of Capacity for Change LLC to assist in this search. Interested candidates should e-mail a cover letter describing their interest in the position and any salary requirements and a resume to jason@capacityforchange.com. The Phoenixville Community Health Foundation is an Equal Employment Opportunity employer. This position is not open to any third-party recruiters, consultants and/or staffing vendors at this time.